My daily schedule is somewhat odd. I’ve been pushing more and more towards having a relaxing morning start. I take the dog for a walk, I do a little yoga, I make coffee, and then usually sit down to read for a bit. I love that my mornings don’t feel rushed. I jump in to whatever I’m doing that morning (usually web design/other random work stuff) around nine and work until I have to go to my other work around noon. My problem comes when I realize it’s 11:45 and I have to leave in 15-20 minutes. I’m notorious for loosing track of time in the mornings. I try really hard to make sure I eat before I leave since the town where I work is 30 minutes away and there aren’t any places I enjoy eating from. So if I don’t eat at home, I usually don’t end up eating or I have a bagel. This quesadilla has been my answer quite a few times this week. It’s simple to throw together. No ingredients need any pre-cooking. 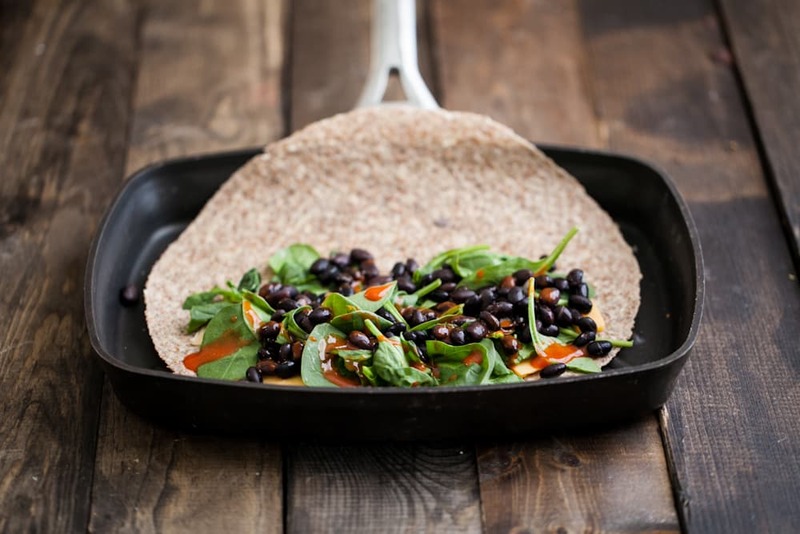 I grab cooked beans from the freezer, rinse them under hot water and sprinkle everything together in on the tortilla. It’s a filling meal that keeps me on time when I’m attempting to rush out the door to get to work. Preheat skillet or griddle over medium to medium-low heat. Rub one side of each tortillas with garlic clove and then brush with olive oil. Place olive oil side down on preheat pan. 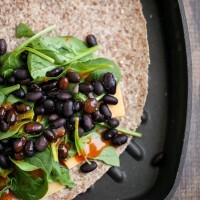 Sprinkle cheese, followed by spinach, black beans, and finally cilantro on one half of the tortilla. Squeeze a bit of lime juice over mixture, followed by a few dashes of hot sauce if using. Fold tortillas over and let cook on each side until crisp and beginning to brown, 3-5 minutes depending on how hot you have your pan. *I usually use what I have in the refrigerator which happens to be either Tillamook cheddar or Taleggio. Any cheese that melts well will be great. 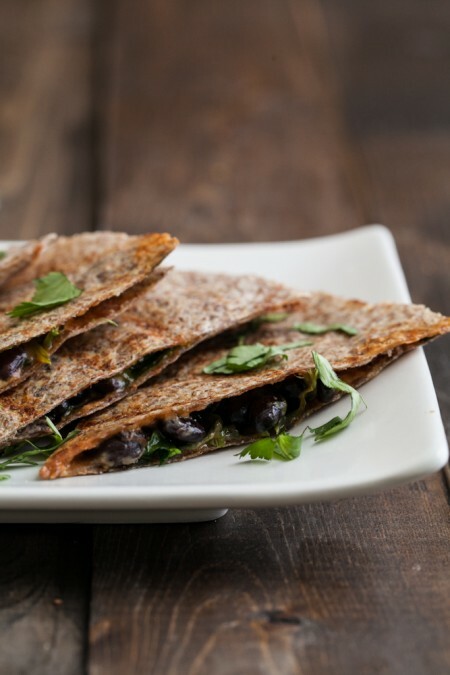 We love quesadillas around here too! That first image is beautiful. Mmmm, this sounds so simple and good! I love mexican food! I love 10-minute meals. Brilliant! Love the simplicity to these! Yum! Yum!! 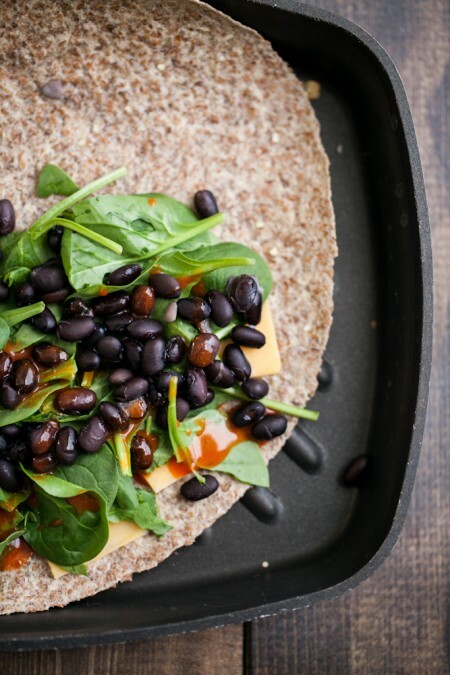 I love black beans and putting them in quesadilla is just so good! I love a good, healthy quesadilla! Without cheese!! Hi Erin. I too LOVE a calm non-rushy morning. This quesadilla sounds lovely! I will have to make it myself. I really enjoy reading your blog on your perspective interlaced with your lovely pictures. The dish of chocolate is my screen saver! 🙂 I also enjoy making your recipes. Keep them coming! I made this today! It was GOOD! I just found your blog not too long ago…and I’m loving it. Nice to have some easy, healthy recipes. Thanks so much! You’re welcome and so glad you liked it! Hello! I’ve been reading your blog for a while, and today I made a huge batch of black beans and … forgot them on the stove. They were a bit overdone when I remembered about them, but I made these quesadillas with my home-made tortillas and they were really delicious! Thank you!